One of the ways of retraining your muscles to align to better posture is by wearing a posture shirt. The best posture corrector shirts have elastic bands and are specially stitched to guide the body to be in an upright position by compressing various muscles. Posture correcting shirts are mainly used by athletes to improve their performance. The shirts are especially popular with pitchers and golfers. Chiropractors also recommend the shirts to people suffering from back, neck or shoulder pain. There are different posture performance shirts in the market. You should read consumer posture shirt reviews to know what to expect of specific shirts you may be interested in. Below is a review of the best posture shirts this year. The Zipper is made by AlignMed and comes in two varieties; for both men and women. The posture shirt has posture wicking properties, anti-microbial properties and features vented panels. These features make the Zipper one of the best posture shirts in the market. 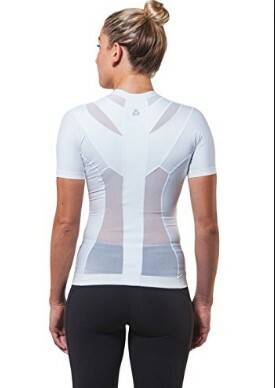 The Zipper posture Tshirt is more than a simple compression clothing. The shirt is made of NeuroBands®, which has different elasticity levels that mimic your muscles. When wearing the shirt, its elasticity strengthens your body naturally. The Zipper shirt fits tight and is a little bit warm. When you feel the warmth, this is a sign that the compression fabric is stimulating your muscles. The shirt is available in both white and black and comes in 5 different sizes. Make sure you order the right size shirt to benefit from its posture correcting ability. This V-neck shirt has been proven to improve athletic performance. The shirt compresses your muscles and helps to align the shoulders and the spine, thereby promoting proper posture. The shirt is popular with athletes and can be worn when you are recovering, running or working out. The shirt is made from a combination of Lycra and Nylon and uses a technique similar to athletic taping to align your spine and muscles and, in turn, improve your posture. 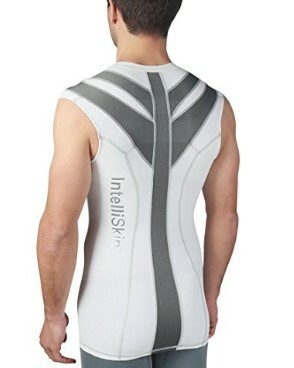 Read the full review of the IntelliSkin posture shirt here. If you want to spot a well-built appearance, this is the shirt for you. The posture Tshirt is designed and manufactured by Frogwill and helps to build abdominal muscles. The shirt compresses your lower back and abdominal muscles, giving you a sculpted body. The shirt comes in 5 different colors (white, purple, blue, gray and black) and is available in 4 different sizes. The compression shirt looks like a normal shirt but when you wear it, you will feel it tightening your body to get you that great shape you want. Many people do not know the difference between posture correcting shirts and braces. When searching for the best brace for correcting your posture on the internet, you may come across recommendations of the best corrective shirts as well. What is the difference between the two? Posture helping shirts are lightweight and elastic. The shirts are made of breathable and comfortable fiber. Moreover, they fit the body well. 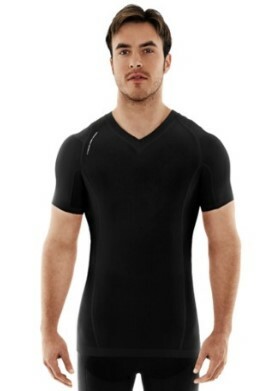 However, if you love wearing loose clothes, you may find a corrective posture support compression shirt uncomfortable. The profile and seams of the shirts concentrate on your abdominal and lumbar muscles. They also strengthen the back. Wearing a posture correction T shirt can help hide some parts of your body that are a little overweight. Posture braces provide more support than posture enhancing shirts. Apart from this, they focus on one special area of the body, usually the lower back. If you have an injury or usually slouch while seated, you can use a posture brace maintain proper posture. A posture corrector shirt will not help you in this case. Most posture corrector braces are made from durable plastic mesh that guides the shoulder and spine. The braces are used on the lower rib area to support the upper body weight. When wearing a posture corrector, the area below the cervical vertebrae is pulled, making your spine stronger. Both posture corrector shirts and braces can be suitable for you depending on what you want. If you feel a corrective posture support compression shirt is too tight, you can go for a posture brace. If you do not like how posture braces feel on your body or find them too bulky, choose a posture correction T shirt.